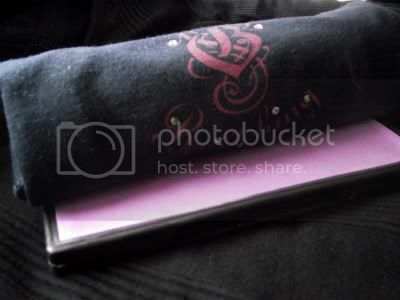 In topic with this week style post, like I promised I’ll tell you the secrets behind my dvd eyeshadow palette. I want to make it clear that it’s not my genuine idea, other genious minds are to be credited for my enlightment. I knew that there had to be a way to make your own palette at home: depotting with a candle (Euforilla’s Advice: put a scarf over your mouth and nose, keep the windows open and pause each two or three pans. Then remember that the pans will be hot, so handle with pliers and wait a while, unlike me who forgot, and that’s how some pans got chipped) and use a dvd case, I don’t have a specific tutorial for this, I just read about “palettes in dvd cases” and I figured it out on my own (E’sA: hotglue doesn’t work that well, don’t even think about vynil glue, just go for superglue. then just slide a pretty paper in the cover part, and you’re done!). (in the background there are a brown, a burgundy, some “skintone” ones, and a pink blush…let’s see if you can guess my eye colour based out of the shadows I use :P). 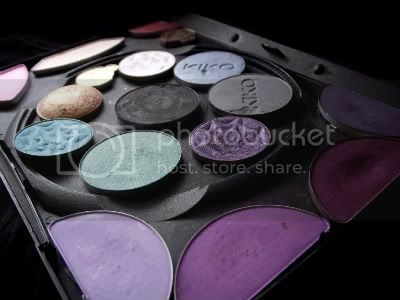 But there’s more DIY, in a recycling way: what do you do with super old shadows, or shadows you don’t use for the unfitting colour, or shadows you want to substitute with “green” products? Use them to paint! Or hand them over to someone who paints, with these instructions: mix the powder eyeshadow with vinyl glue, et voilà! Supershiny opalescent acrylics ready to use! 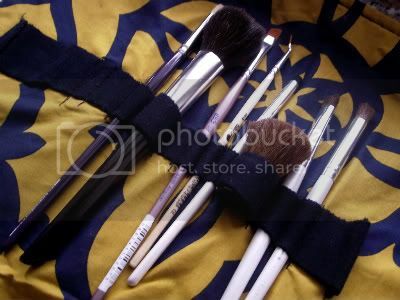 An then, am I giving you the colours but not the brushes??? Never! This summer I finally sew myself my own brushroll, two fabric rectangles with a slightly elastic strip applied in the center, with all the casings sewn on. But this is not the interesting part! This video by EnKore will tell you (I bet there are several more, but this is the one I used) how the most high end, big name, professional brushes are totally like common painting brushes, and you can buy them for a fraction of the price, in any art department store. 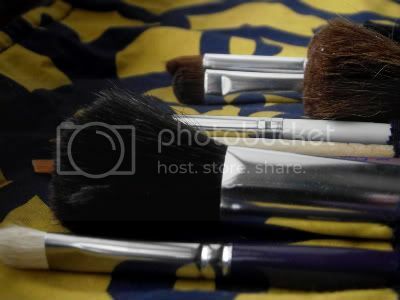 Watching makeup videos may leave you with the urge of having tons and tons of different brushes, but if you think carefully about it, you can be ok with the brushes you’ll use most!